Celebrity-mania is a real phenomenon. While spending thousands of dollars on plastic surgery to look like a celeb is not unheard of, Kate Middleton's superfan - Kate Urbanksa, 29, has a different way to show her love for the Duchess Of Cambridge. She copies her - outfit for outfit. And while Kate Middleton's wardrobe can run into thousands of pounds, her super-fan replicates her wardrobe for a fraction of the cost. Why does she do it? In an interview with The Daily Mail, she said, "There was something about The Duchess' style that instantly struck a chord with me. She never follows trends and she picks clothes that are comfortable, elegant and classic." More importantly, how does she do it? She scours eBay like a hawk and has a tailor to reconstruct pieces. She prefers to get discounted high-end items than purchase high-street replicas. In the same interview, she continued "Rather than going for high-street replicas, I like to buy the exact high-end outfit the princess wore so I'm always looking for bargains. I check Ebay and online auctions daily so I can get the exact pieces Kate Middleton has worn without the hefty price tag. It doesn't matter whether I'm on the bus or waiting in line for something, whenever I have a spare moment, I'm always checking the different sites." But sometimes, getting a replica made is the only option. Take for instance the dress that the Naeem Khan dress the Duchess of Cambridge wore when she was in India (pictured below). 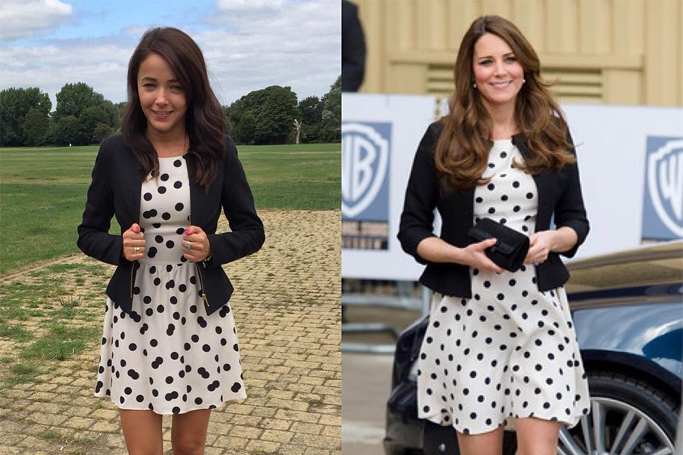 The dress cost a whopping £3,192, but Urbanska found a replica online for just £30! Check out other dupliKates below.